During the Christian reconquest of Spain in the thirteenth century, the Blessed Mother appeared to a cowherd tending his cattle near a village named Guadalupe and told him to dig in a certain spot. He did as instructed and unearthed an iron casket in which was found a statue and a note about its identity. The statue was a likeness of the Blessed Mother. Christians fleeing the Muslim invasion of Spain in the 8th century had buried it there in an unmarked location to protect it from destruction. The statue was said to have been carved by St. Luke himself and had been a gift from Pope St. Gregory the Great to the bishop of Seville. A chapel was erected on the spot and soon became a popular shrine. Queen Isabella was a frequent pilgrim. 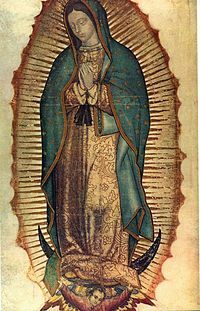 Christopher Columbus was said to have invoked the help of Santa Maria de Guadalupe several times during his voyages and prayed at the shrine on several occasions. His flagship carried her name and he christened an island in the Caribbean in her honor. The explorer, Hernando Cortez was also a devotee. 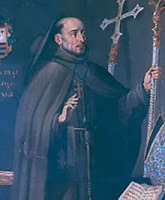 One not-so-famous pilgrim was a humble Franciscan priest named Juan de Zumarraga who was on his way to the New World to become the first bishop of Mexico. It was to Fr. 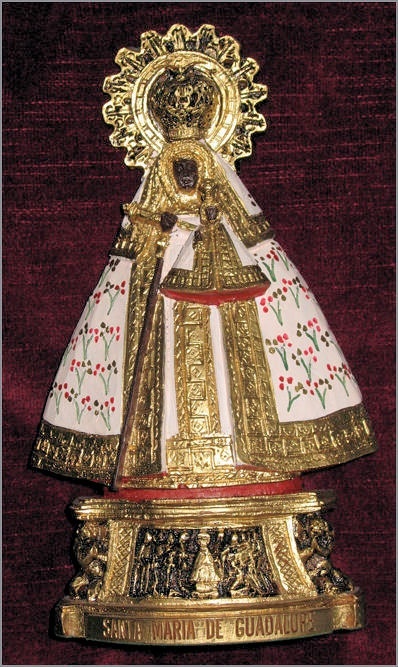 Zumarraga (he was bishop-elect at the time) that an aging Aztec, with the Christian name, Juan Diego, would show his tilma filled with flowers at the instruction of the Blessed Mother on December 12, 1531. For the Aztecs, “the devourer” and the “stone serpent” were one and the same: the dreaded Aztec god, Quetzalcoatl, to whom tens of thousands were sacrificed each year by having their beating hearts gouged out of their living chests. 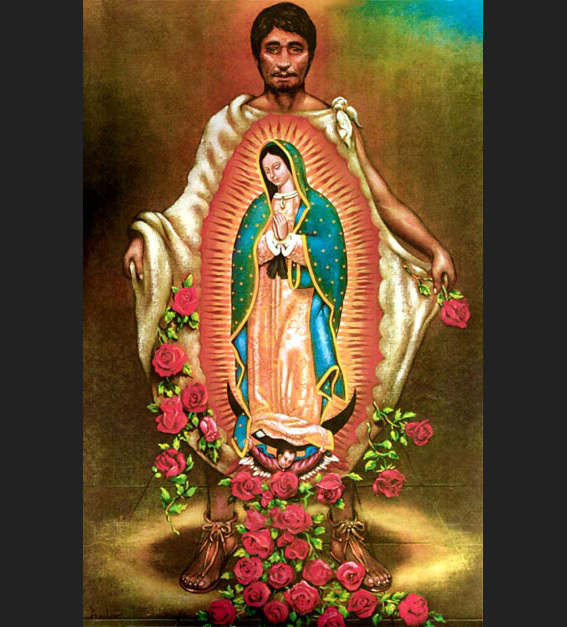 Despite the confusion over the name, the Aztec understanding of who the Virgin said she was and Zumarraga’s believing her to be the Immaculate Conception, were easily reconcilable. One of the scriptural foundations for the Immaculate Conception is Genesis 3:15 where, upon the fall of Adam and Eve, God warns Satan: “I will put enmity between thee and the woman and between thy seed and her seed. She shall crush thy head, and thou shalt lie in wait for her heel”. 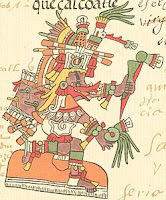 With Quetzalcoatl, the serpent, drinking the blood and eating the hearts of tens of thousands of Aztecs every year, the Franciscan missionaries saw the catechetical opportunity in associating the “woman” of Genesis 3:15 with the Aztec understanding that the woman on the tilma was “she who saves us from the devourer”. 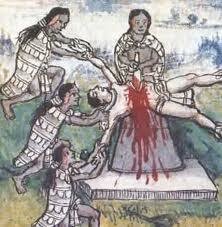 Within a few years, over eight million Aztecs converted, the largest single mass conversion in history. But let us jump forward to our own time in which “the Devourer” has so obviously returned. While we no longer rip the beating hearts from the chests of living humans, we do rip living humans from their mothers’ wombs at the rate that makes the sacrifice to Quetzalcoatl look tame. Whereas the Aztecs would kill as many as 20,000 humans a year, we do that through abortion, in the U.S. alone, every 5 days. 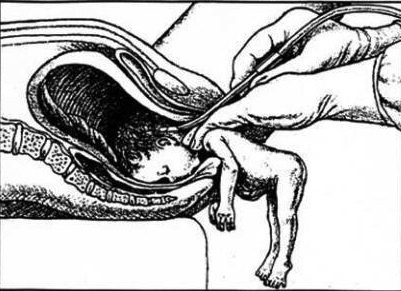 Perhaps it is just coincidence, but there is no denying that abortion on a massive scale took root in our society at the same time devotion to the Blessed Mother began to wane in the post-Vatican II confusion over her identity. Perhaps the most obvious evidence of a change in thought about Mary’s role in our redemption is the modern retranslation of Catholic bibles in which the “she” of the “She will crush thy head...” in Genesis 3:15 is replaced with “he”, and in at least one translation (New Jerusalem), “it”! Check your bibles. However, our modern Catholic translations now abruptly interrupt the context of the passage and insert the male pronoun, while the New Jerusalem Bible - seemingly wont to smooth the obvious bump - opts for a middle ground and inserts the neuter “it”. In any event, Mary, disappears from the text and her redemptive role is seemingly diminished to nothing more than a “useful conduit”, which is what most non-Catholic Christians deem her to be. It’s easy to see why modern Protestant translators would want to diminish Mary’s stature in scripture, but why did we do this to our own translations? Modern scholars argue that the Hebrew in Genesis 3:15 used a word that did not specify “she”, and perhaps, motivated by the current spirit of ecumenism at the time of the newer translations (ca. 1966-1970), they opted for a pronoun less challenging to non-Catholics who do not accept Mary’s full role in God’s plan of salvation. 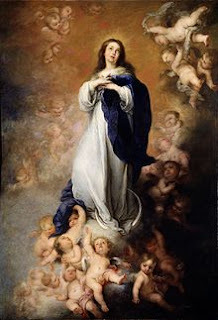 It is not surprising, and perhaps expected that these same translations, after appearing to alter Mary’s redemptive role in Genesis, also deleted “full of grace” from the angelic salutation in Luke 1:28, which is the other foundational scripture reference for the Immaculate Conception. In most modern Catholic translations “full of grace" has been replaced with “favored one” or “highly favored”, which is how Protestant bibles already had it translated. This may all seem like linguistic minutiae and no big deal, but a quick “google” will show that Protestants depend specifically on “favored” in place of “full of grace” to disprove Mary’s Immaculate Conception, and THAT’s a big deal! And with the adoption of the New American Bible in 1970 (which uses “favored one”) as the official translation of the U.S. Catholic Church, it might seem that we decided to help them along. On December 12 we celebrate the feast of the one who revealed herself as “she who crushes the head of the serpent”, the one “who saves us from the devourer”, the woman of Genesis 3:15 who appeared to the New World pregnant with the promised “Seed” of salvation, and burnt her image into the rough weave of cactus fibers that we might, 500 years hence, yet be reminded of who she is and what she was ordained by God from the beginning to do. 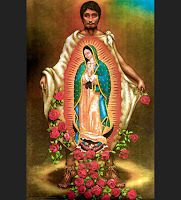 Perhaps the Mother of God gave us her name at Guadalupe in anticipation of the present confusion. 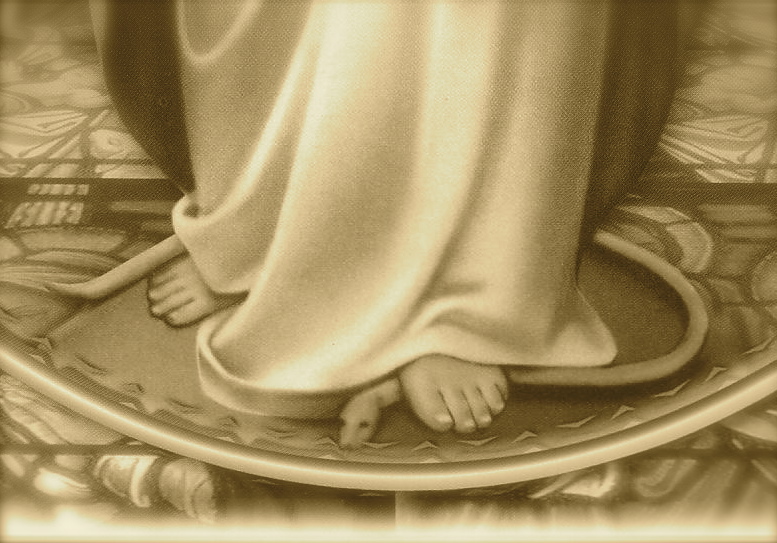 Perhaps our bibles should once again reflect what has been infallibly proclaimed: that “the most Blessed Virgin was, in the name and by order of God himself, proclaimed full of grace”, and that the head of Satan was and is crushed “with her immaculate foot” (Ineffabilis Deus). Perhaps we should learn how to say “Te Coatlaxopeuh”, that we might call on her as the Aztecs did, for in the maddening escalation of the current culture of death, it seems that Quetzalcoatl, the Devourer, has ravenously returned. ADVENT AND MARY : The Church places two major Marian feasts in the two preparatory/penitential seasons of Advent and Lent; Immaculate Conception during Advent and the Annunciation during Lent. This is to remind us of the link between the Savior and the Mother who brought Him into the world. 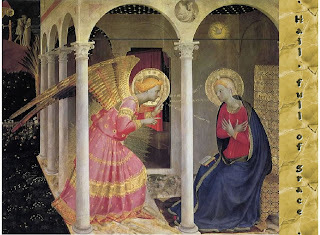 Mary serves as the "guarantor," as it were, of our Lord's earthly and human dimensions. The Son of God truly, historically, became :one of us" to save us. Mary also serves as the best example of a human soul surrendering itself to the divine invitation. She teaches us to wait, look for, hope, prepare, pray, surrender. "I am the handmaid of the Lord. Let it be done to me according to your word." God and sin are incompatible. God cannot take His human nature from a mother who, even for a single instant, was under the rule of sin, so that the devil can never say that the Messiah came from a mother who was under his yoke even for a moment. 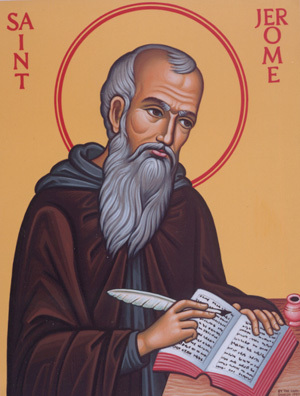 Jesus comes to overthrow the yoke of Satan, and He did it first by preserving His mother from the sin of Adam and Eve (Original Sin) from the first moment of her conception in the womb of Saint Anne. He did this in view of the salvation He won for us on the cross. Mary's immaculate conception is the first blow against the reign of Satan. This first victory tells us that we, too, can overthrow the rule of Satan in our lives; not beginning at our conception, but after. We cannot begin our lives like Mary, but we can end our lives like Mary. INTROIT : It is Mary who speaks here, like a victory hymn! But it is the victory of a woman; a human being - someone like us! God saved Mary in a unique way, but that means He can save us, too, in a different way. Mary has been clothed with a robe of salvation; God did not allow the sin of Adam and Eve to touch her at the moment on her conception. Free of all sin, Mary is clothed in holiness, righteousness and justice. She is to God what He originally intended mankind to be - His children, who know, love and serve Him completely, with no rebellion or sin. In order for Mary to become the Mother of the Son, the Daughter of the Father had to become the Spouse of the Holy Ghost. She is a bride, wedded to the Holy Ghost who overshadows her and through whom she conceives God the Son. Husbands give their brides jewels, to show her how precious she is, worth all those jewels and more. Jewels represent the beauty of the bride. Mary's jewel is her sinlessness. But the newly baptized are also clothed with a mantle of salvation; they become spotless the moment they are washed clean in baptism, and are given a white garment as a sign of that. When we confess our sins and are absolved by the priest, we wash that white garment that has been stained by personal sin. Mary's immaculate conception robs the devil of his ability to rejoice over Mary's conception. With the rest of us, the devil smiles as he sees each of us conceived in Original Sin. In Mary's conception, the devil shudders with fear because he sees his power over mankind crumble for the first time. COLLECT : The Collect beautifully summarizes the doctrine of this feast. It makes clear that the Immaculate Conception is God's work ("O God...didst make her"). It also makes clear that God's intervention was necessary ("didst preserve her"), otherwise Mary would have been conceived in Original Sin like everybody else. God saved Mary in a unique way; we ask that He save us in the way marked out for the rest of humanity. Both her salvation (preservation from sin), and our salvation (forgiveness of sin) are due to the blood of Christ. EPISTLE : This passage from Wisdom is about God the Son; He is God's wisdom, His word (logos). The Father made all things in His wisdom; therefore, He made all things through the Son, who is His wisdom. But this passage also refers to Mary, the Mother of the Son. From all eternity, God knew He would send His Son, His word - to redeem from sin what He had created in original justice. From all eternity, God knew that this Son would need an earthy mother who would bring Him into the world and give Him His human nature and flesh. Thus we can say that Mary was always in God's mind, from all eternity, and that He was with her from all eternity. God delights in being with His children; He delights in being made man through Christ's Incarnation; He delights in being the Son of Mary and the Spouse of Mary. At the end of the passage, we see Mary as the model : watching at the gates, waiting at the door. It speaks of Mary's holy childhood, as a maiden in the Temple, praying and serving. It is Advent; we are also to watch and pray. GRADUAL / ALLELUIA : Here it is God who speaks, through His angel! 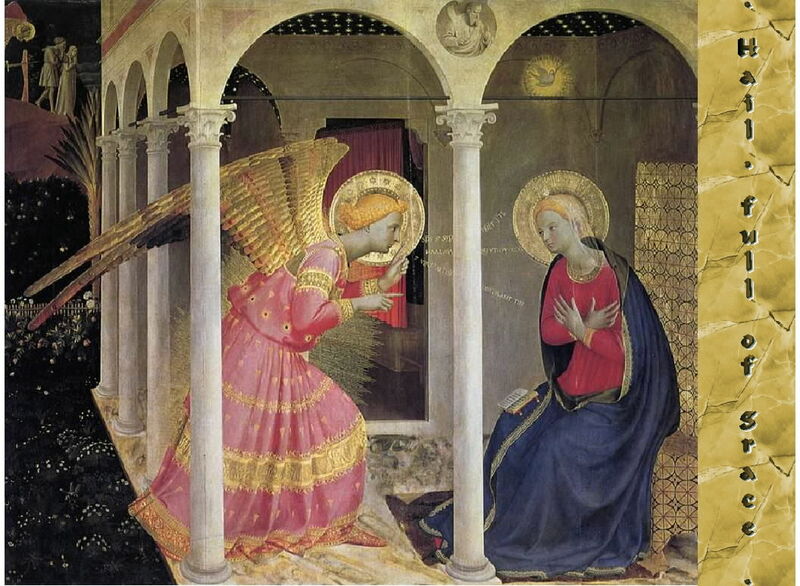 The angel tells Mary : Blessed are you! Holy and heroic women of the Old Testament (like Judith, from which the Alleluia verse is taken) foreshadow God's most heroic woman, Mary. Judith, a mere woman, beheaded the mighty general Holophernes; Mary, a most humble woman, defeats Satan. She is the glory of our human race, and she makes possible our own salvation and future glory. GOSPEL : A short passage, but gets right to the point. 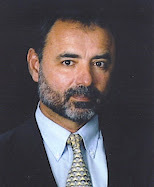 God decisively enters human history; we can name the place, the people and their tribe. In Luke's Gospel, we can also name the period in history. Mary is full of grace. The English translation limps, when compared to the original Greek. In the Greek, Mary is continuously replete with grace, saturated, dripping with God's favor; in the past, even now and into the future. She is so full of grace, that there is no room for anything contrary to grace. It is God's goodness that has been poured into her. When we honor Mary, we honor God who made her and who made her sinless. OFFERTORY : The words of the Offertory are familiar and repeated. But we make them here at the time when we offer bread and wine to God at Mass. Our poor offerings pale in comparison to Mary, who is sinless and pure. But we sinful people make our offerings in union with Christ and Mary; they make our gifts acceptable to God. SECRET : I point out in the Secret a reference to a lesser-known teaching about Mary's virginity; that it is a perpetual virginity. We mean to say here that Mary remained physically intact and virginal not only before and after giving birth to Jesus (ante partum/post partum) but also during birth (in partu). See paragraph 499 of the Catechism of the Catholic Church. The Secret states that Mary gave birth to Christ, without losing the glory of her virginity. COMMUNION : When we praise the work, we praise the worker. We praise Mary in order to give greater praise to God who has "done great things" for her. But God wants to do great things for us; in a different manner, but great nonetheless. God wants to turn sinners into saints. That is a great work, done at a great price - the blood of Jesus. POST-COMMUNION : We start out in life differently from Mary; we are conceived wounded by Original Sin. Mary was conceived in perfect human condition as God intended man to be. But we can end our life as Mary ended hers; to die in the State of Grace, as she was full of grace. BRETHREN - again a reminder. Make the Missal your best friend. Read it, pray it, reflect on it. Let the LITURGY FORM YOU, mold you into a saint.